Ham biscuits are a staple of Southern celebrations. 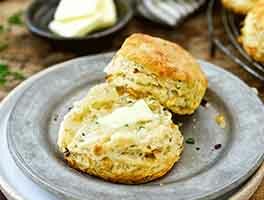 Traditionally, biscuits (either tall, light, and tender; or thin, crisp, and flaky) are cut in half and layered with flavorful country ham. 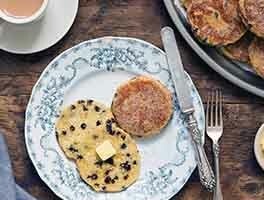 These days, some cooks have adopted an easy shortcut: adding chopped ham (and cheese, if you please) right to the soft biscuit dough, then simply dropping the dough onto a baking sheet, rather than rolling and cutting it. The result: a tasty, all-in-one breakfast or brunch treat. Ham biscuits are suitable for any occasion, from elegant to down-home. For that reason they're often found on the sideboard or table on New Year's Eve, or New Year's Day. 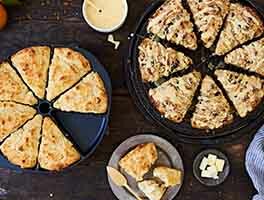 Our northern version of this Southern treat uses King Arthur Flour, Vermont cheese, and Original Bakewell Cream, the leavener Mainers love most for their biscuits. 53 mins. to 1 hrs 6 mins. *NOT Bakewell Cream Baking Powder; just plain Bakewell Cream. **Use the greater amount of milk if you use all-purpose flour; the lesser amount if you use Perfect Pastry Blend. Preheat the oven to 475°F. Line a baking sheet with parchment (for easy cleanup); if you don't use parchment, there's no need to grease the pan. Add the ham and cheese, stirring until well distributed. Add the milk, mixing until everything is moistened. Turn the dough out onto a clean work surface (a silicone mat works well), and fold it over once or twice. Divide the dough in half, and pat each half into a ¾"-thick circle, about 6" across. Cut the biscuits with a 2" round cutter, or the cutter of your choice. Place them on the prepared baking sheet. Brush the biscuit tops with milk or melted butter. Sprinkle with grated or shredded cheese, if desired. Bake the biscuits for 6 minutes, then turn off the oven. Leave in the oven for an additional 7 to 10 minutes, until they're golden brown. Remove from the oven, and serve warm; as is, or with butter. Yield: about 2 dozen big 2" biscuits. To make easy drop biscuits, drizzle in enough additional milk, as you're mixing the biscuit dough, to make the dough sticky: about 4 to 5 tablespoons milk should do it. Drop the dough by 1/4-cupfuls onto the prepared baking sheet; a level muffin scoop works well here. Bake as directed. You'll find that you may need to use more milk in the winter, when the air is dry; and less in summer, when it's humid. Thanks for the quick answer. I tested it with the water and nothing happened so I guess that was my problem. Was too old. Two months ago it worked fine though but I suppose nothing lasts forever. My cutters were brand new stainless steel ones (bought specifically to make these biscuits) and I don't believe I used too much flour, just what the recipe said, and didn't work any extra in when I patted it out. I made this recipe two times before and they were just wonderful! However, when I made them yesterday something went very wrong. They never rose at all! Now I have some hard, flat things that don't taste too bad. I'm wondering if my Bakewell Cream has lost its oompf! How can I test it? Delightful biscuits to start the New Year with. Needed a bit of extra water on a dry, cold morning. Haven't made this yet, but it looks delicious. Here's a suggestion if you think your ham may be a bit too mild flavored, like alldogz11: try frizzling your ham bits in a hot pan until the edges brown well, then blot well on paper towel before making the biscuits. I live in the South, so I modified these biscuits to be more like Southern biscuits. I used self-rising flour (omitted the Bakewell cream, salt, and baking soda), shortening in place of butter, buttermilk for the regular milk, and used country ham. They turned out very good. 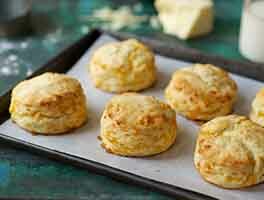 Fluffy biscuits with a nice saltiness from the country ham. Would make again. These biscuits were a huge hit! I came here to look for a recipe to make for a new years pot luck, and wanted to use up the leftover ham I had. The title won me over here....perfect! Even though I live in Maine now, I am born and raised a new Yorker, and so I had never heard of Bakewell Cream....but sure enough there it was on the shelf of my local grocery store, right next to the baking powder. The biscuits came together quickly and easily, and even though it makes a big batch I made an extra 1/2 a batch because I had a feeling they were going to be well received, which made a HUGE dough that was a little unwieldy to handle, but I managed. When the crowd at the party saw those biscuits, eyes lit up as they ooohed and ahhed over them. I caught friends who usually go for only the healthy stuff grab them, and I delighted as I watched the children split them open, slather them with butter(not necessary but hey....why not! ), and chomp down! Feeding friends and family homemade treats like this makes it all worth while....such gratification! The mustard and onion powder was subtle but totally delicious, so do add it if you have it. I'm looking forward to using my Bakewell Cream as a substitute in future recipes. The only thing I may try next time(and I DO plan on making these again), would be to use buttermilk instead of regular milk because I love the buttermilk in my baked goods. Just not sure if I will need to adjust the baking soda or Bakewell?? I will check in with you on that when I do! Thanks King Arthur for another great recipe! Happy New Year!! I didn't have regular milk, but used fat free buttermilk. I do believe the Bakewell Creme made a huge difference in the fluffiness in this recipe. I had a smoked ham that was a bit too mild really (even though i put 8 oz in the recipe) so i am using country ham on the next one. I like a good solid ham taste and while these were excellent i think my choice of ham was a bit mild. These were easy and quick to make...i used unsalted butter because of the amount of salt in the ham and the cheese...i wish i could have made it exactly as the recipe called for but the substitutions worked great! i am making more this evening!!! This recipe is fabulous. 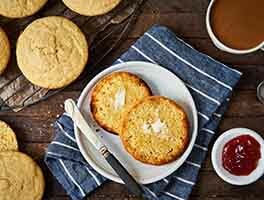 I had never had success making "baking powder" biscuits, but I was intrigued by this recipe when I saw it. I purchased the King Arthur Pastry flour and the Bakewell Cream and made the biscuits. Absolutely fabulous. 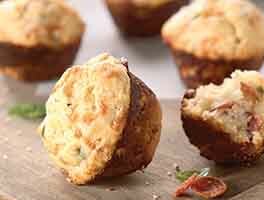 Once you make the Cheddar, bacon scones......these won't taste that good at all.!!!! Sorry! First time I've ever made biscuits! Delectable, and awesome served today with black eyed peas. What a way to bring in the New Year.